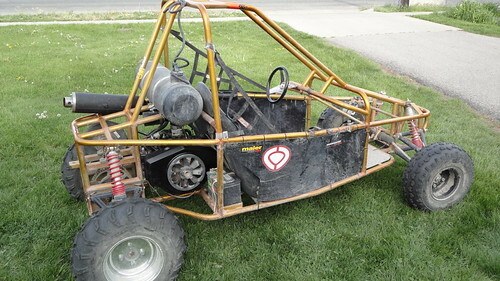 Time for a few more improvements on the mini buggy. 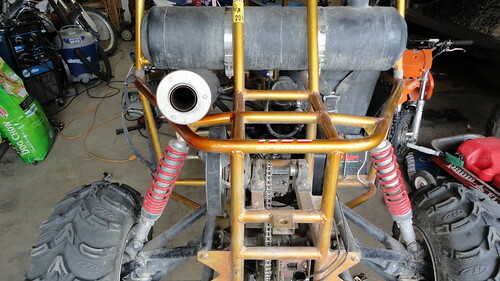 The "muffler" we originally used was a little ratty sounding and to get more flow made it even more ratty. 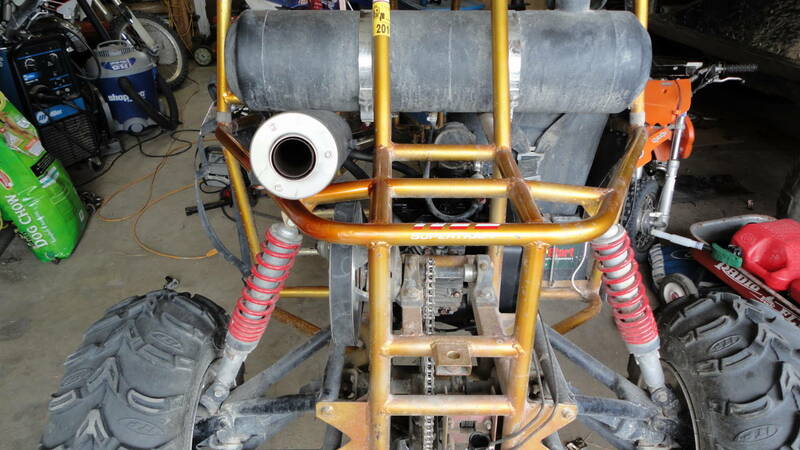 For whatever reason, we didn't think of this when we built it, but there are a ton of slightly used stock mufflers out there that people take off bikes or 4 wheelers when they upgrade to an aftermarket exhaust. This stock YZF450 muffler was more than adequate for this motor and it was cheaper than the one we had on there before. We found it online for $40 and the owner claimed it was only used for about 3 rides. It has a nice mellow tone and is really quiet while allowing for more flow and power at the same time. Only problem is that once installed we could hear the noisy engine, so we pulled the engine and dug in to see if I could quiet it down at all. We cleaned it up and removed some parts that were unused and just rattling around. We also made sure everything was tight and lubed well. It made a huge difference, but the engine is still a little noisy by it's nature. 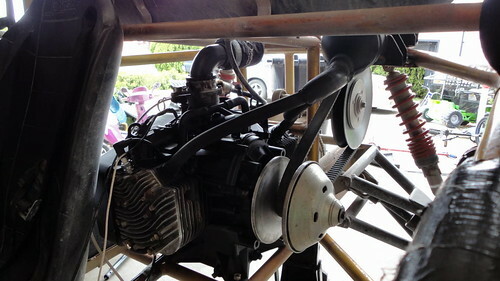 While we were at the engine work we took a look at the clutch. The clutch faces come new very smooth and can glaze up after use. Taking a 180-200 grit piece of sandpaper to it in a circular motion will remove the glaze and put a little bit of a bite on the surface. So far all the work we've done really seems like it paid off. It's got a nice punch to it off idle that it didn't have before and it seems to accelerate a little better. Not only that, but it looks good! Check it out. I love the work you do and the way you write about. I do wish you would create a little more distance between the fuel tank and muffler. Thanks. 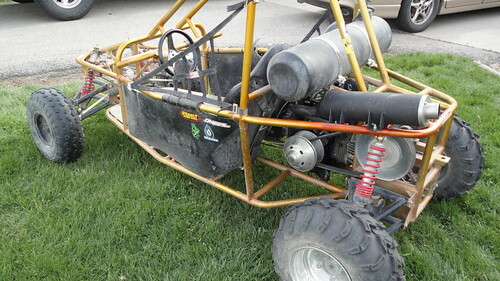 We had the same thought about the muffler, maybe I could raise the tank a bit and/or put a baffle/heat shield in there. So far it hasn't seemed too hot right there, but we'll keep an eye on it. Thanks for the insight. Cool upgrade just a question, did you do some rejetting on the carb? Thanks, yes, it has adjustable jets that had to be tweaked a bit. That mod you've just made was really awesome. I want to ride this mini buggy and wonder how it feels driving this cool auto. 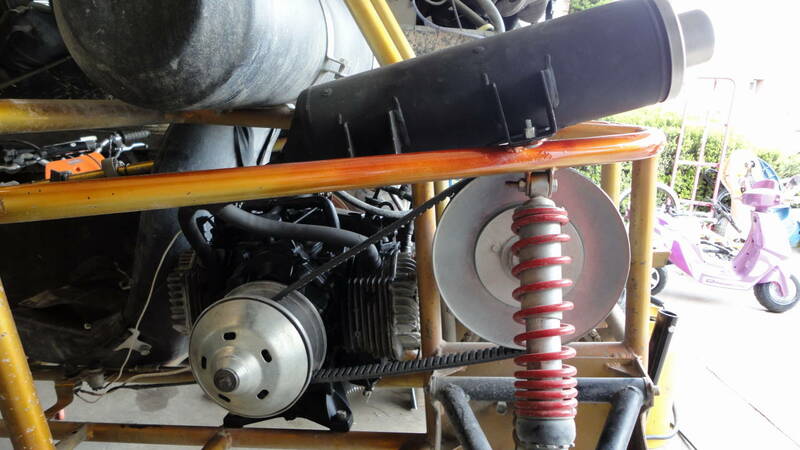 You provide the best solution for the automobile engineering. Wow $40 is a bargain. I wish i had more space around me so i could shoot off straight out my garden without having to bother with the trailer.